Traveling There: Flights to and from Los Angeles to Papeete, Tahiti are available through Air France, Air New Zealand, and United Airlines. Web links and phone numbers are available at this magazines Airlines page. They are approximately eight (8) hours in duration. Depending on the passenger's home city, it may be more convenient to stay the previous night in Los Angeles before flying to Tahiti. Note that French Polynesia has only a two hour time zone difference from Los Angeles. Although French is the official language of French Polynesia, most of the residents prefer Tahitian and speak English as well. Staying there: The traveler's first decision is whether to pick one or two islands for a relaxing stay, or to visit a number of islands via a cruise ship. The web links below should help with that tough decision. A good recommendation for an on-island stay is the island of Moorea, as it is close to Tahiti, but is laid back and extremely beautiful. 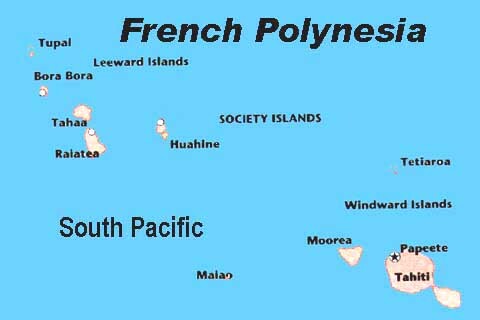 Although French is the official language of French Polynesia, most of the residents prefer Tahitian, and they speak English as well. Our recommended guide books are Frommer's South Pacific and Lonely Planet Tahiti. They provides useful information for lodging, dining, beaches and sites for each island in the Society Islands, as well as Fiji and Tonga. Frommers falls short on sporting activity listings, so some research on the Web (links below) can cover for that one shortfall. Return to Dazzling French Polynesia article.